Chemistry is everywhere. It's in our food, our drink, our brains, and our air. 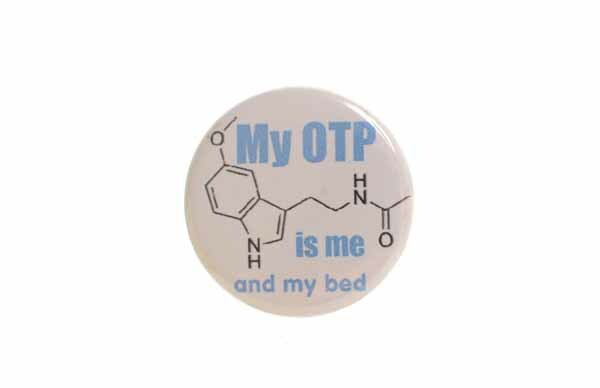 I wanted to celebrate chemistry with a pinback button set. 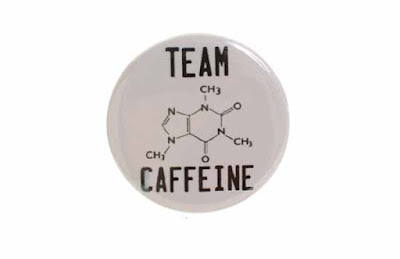 The button series of molecules started with Team Caffeine. 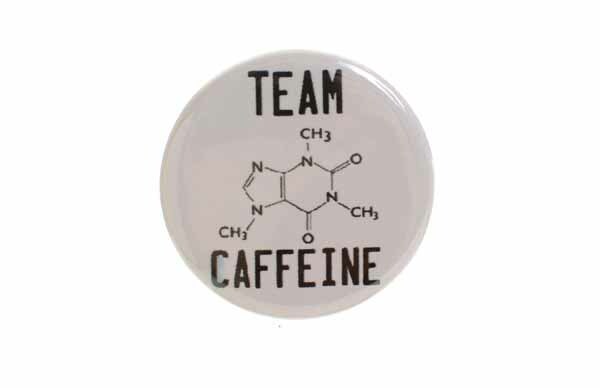 Caffeine is dear to our hearts. There are different ways to depict the CH3. They are all the same for consistency instead of one being H3C. The type is simple as we only want one thing from caffeine: to wake up. The design is black and white. No flashy colors here. I wanted to be straight and to the point with this design. 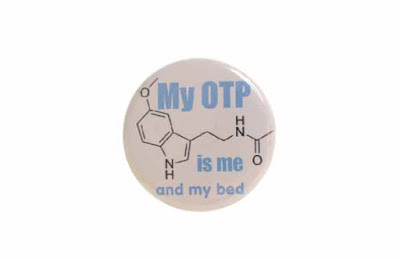 My OTP is Me and My Bed was next. One of my dear friends says that all the time and she let me use it as a button design. I chose the melatonin molecule as this is the hormone released when we get sleepy. Blue is a calming color. I chose it for the text to foster a pleasant feeling when viewed. 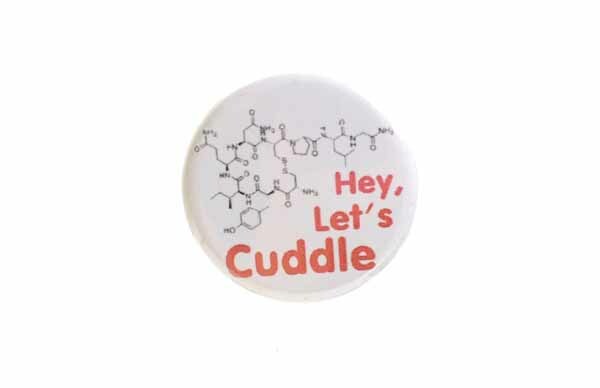 I choose oxytocin to go with the Hey, Let’s Cuddle design. 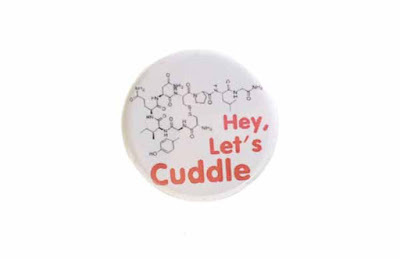 Oxytocin is known as the cuddle hormone. I chose orange as a color to complement the blue of the OTP pinback button design. The H-A-P-P-Y button took the most amount of thinking. 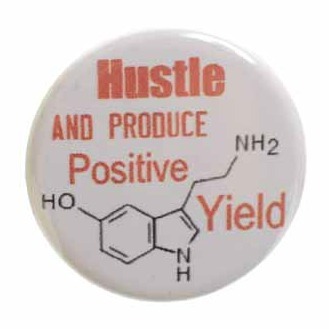 I knew I wanted to make a button with serotonin. I wanted to use an acronym too. 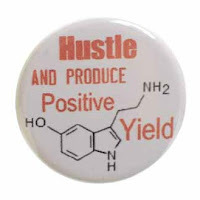 It took a few weeks to come up with Hustle and Produce Positive Yield. It came to me as I was getting ready for bed one night. I rushed to find paper to write it down. I chose orange again but a brighter version to facilitate urgency. Serotonin is the hormone featured here. Serotonin is associated with happiness. 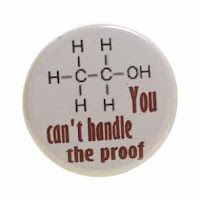 You Can't Handle the Proof features the ethanol molecule. Ethanol is formed from the fermentation of sugars to create alcohol. This pun came to me one day while on a family vacation. I chose a red color as a warning. Ethanol looks like a simple molecule but it can certainly pack a punch.